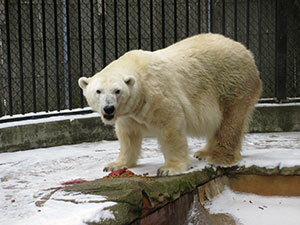 The Zoo's female polar bear, Snow Lilly, will turn 30 years old on Friday, December 5. Snow Lilly arrived at the Milwaukee County Zoo in 2005, and she continues to be a "fan favorite" almost 10 years later! Zookeepers report she has an independent, spunky personality, and can often be seen frolicking in the pool. Polar bears use their large paws as paddles, and their powerful sloped shoulders and high hips help them glide smoothly through water. Snow Lilly eats lard, which is similar to seal blubber that she would eat in the wild. The lard helps keep her fur coat in good condition and boosts her energy levels.